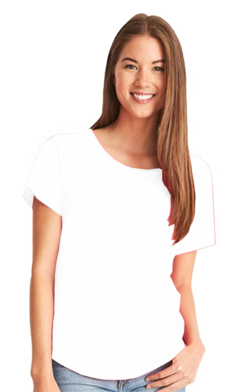 - Next Level Ladies 4.0 Ounce Ideal Dolman T-Shirt. - Soft, breathable lightweight 60/40% cotton/poly 30 single, 4.0 ounce fabric. Next Level Ladies 4.0 Ounce Ideal Dolman T-Shirt. Soft, breathable lightweight 60/40% cotton/poly 30 single, 4.0 ounce fabric. Set-in collar 1x1 baby rib. Tear away label. Sizes XS-2XL: White, Black, Cancun, Dark Gray, Heather Gray, Hot Pink, Midnight Navy, Military Green, Mint, Red, Royal, Turquoise.